The new Treasures exhibition at Peterborough Museum and Art Gallery is a once in a generation event, which champions Peterborough’s significance as a city. For years, Peterborough has had the reputation of being just ‘a new town,’ with businesses arriving in the 70s and 80s, stimulating the growth of the area. While there is certainly plenty of growth in Peterborough, the idea that Peterborough is either ‘new’ or ‘just a town’ could not be further from the truth. Peterborough is one of the United Kingdom’s many proud Cathedral cities, comparable in size to Norwich, Exeter and Canterbury. Peterborough Cathedral itself celebrates its 900 birthday this year. Before even then, people have lived in the area that is now called Peterborough for over 3,000 years. Now, thanks to National Lottery Players and the Weston Loan Program with Artfund, National treasures from institutions across the country (including the British Museum and Victoria and Albert Museum) are being displayed together for the first time ever at Peterborough Museum and Art Gallery. Each of the treasures on display has either been found in or has a very strong link to Peterborough, such as the Water Newton Treasure found at Durobrivae (Ancient Roman Peterborough) and the Casket of St Thomas Becket which was commissioned by Abbot Benedict of Peterborough in 1177. Each of these treasured objects has a significant link to Peterborough. Usually they are kept on display in the treasured collections of significant institutions from around the country. Now, for the first time ever, they are being put on display together, for the first time ever, at Peterborough Museum and Art Gallery. The Casket of St Thomas Becket. Thomas Becket is possibly the most famous saint from Great Britain. Thomas Becket was Archbishop of Canterbury and was martyred in 1170 when agents of the King, acting on misunderstood orders, killed him in cold blood. The Abbot Benedict of Peterborough commissioned this casket to hold relics of the murdered saint and took them to Peterborough for safe keeping in 1177. It is widely believe that this is the casket which will have held those relics. 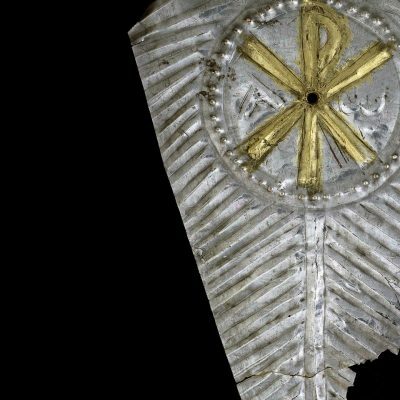 Found at Durobrivae (the fortified Roman town near the village of Water Newton), this treasure tells the story of some of the first Christian groups in Peterborough. It is also one of the earliest examples of Christian silver from the Roman Empire. In the year when the city celebrates Peterborough Cathedral’s 900th anniversary, having this early Christian treasure on display feels especially exciting. This example of a ‘beaker burial’ is from the Copper Age and tells us a lot about the cultural traditions of that time. It was likely used to honour the life of someone important – the goods inside include a wrist guard decorated with 18 gold discs – and was donated to the British Museum in 1974. Found only a stone’s throw from Peterborough, this is the first time the objects have been displayed in the area they were found. This book contains magnificent illustrations of various animals – some real, some mythical – and some descriptions of what they are. One particular highlight is the Bonnacon – a horned, mythical, cow-like beast which escapes from its pursuers through a unique defence mechanism – by firing flaming dung behind it.